Due to the projected track of Hurricane Irma and the impact to the local community, the Ricky Skaggs & Kentucky Thunder performance for tomorrow, Thursday, September 7th has been rescheduled for Wednesday, November 1, 2017 at 7pm. If you have already purchased a ticket it will be honored for the rescheduled performance on Wednesday, November 1, 2017. Ticket holders unable to attend the rescheduled performance will be issued a refund. If you should need any further information or assistance, please contact The Lyric Box Office at 772-286-7827 or Info@LyricTheatre.com. Veteran country music performer Ricky Skaggs and his band Kentucky Thunder are coming to The Lyric Theatre for a performance that will span the country music genre from bluegrass to gospel to mainstream. A multi-talented musician, Skaggs plays a variety of instruments, including the mandolin, fiddle, guitar, mandocaster, and banjo. The 14-time Grammy Award winner will perform songs from his long and illustrious career, including hits such as “Sis Draper,” “Return to Sender,” and “Road to Spencer” among others. Born in Cordell, Kentucky in 1954, Ricky Skaggs began playing the mandolin at the age of 6, performing with the bluegrass pioneer Bill Monroe. A year later, Skaggs would appear on television along with Lester Flatt and Earl Scruggs. In 1971, the country musician began his professional bluegrass career when he joined Ralph Stanley’s band the Clinch Mountain Boys. Ricky Skaggs never looked back, pushing the limits of the bluegrass genre along with progressive bands such as Country Gentleman and J.D. Crowe & the New South. By the late ‘70s, Skaggs turned his focus to mainstream country music when he joined Emmylou Harris’ Hot Band. It wasn’t long until he released his debut album, Waitin for the Sun to Shine in 1981. The album topped the country charts with two #1 hits. With his 1997 album Bluegrass Rules! Skaggs would return to the genre that first defined him, resulting in a series of Grammy Award-winning albums recorded with his bluegrass band Kentucky Thunder. Over his successful career, Ricky Skaggs has received 14 Grammy Awards and 8 Country Music Association Awards, including the respected Entertainer of the Year trophy in 1985. Over the past two decades, Skaggs has continued to make his mark in the country music world, releasing the popular album Mosaic with the Grammy Award-winning songwriter and producer Gordon Kennedy. The song “Return to Sender” off of the album was nominated for two Grammys in the gospel genre. In 2010, the veteran musician was inducted into the Gospel Music Hall of Fame and also received the Cliffie Stone Pioneer Award from the Academy of Country Music. 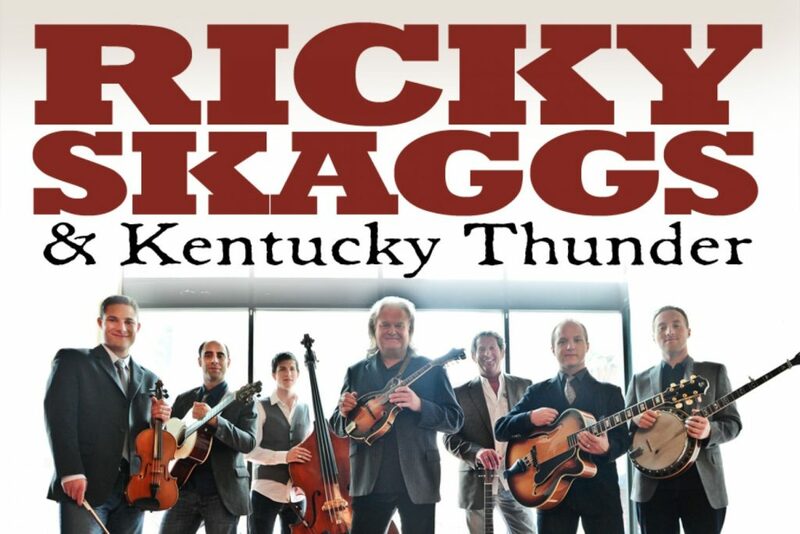 This season at The Lyric Theatre, Ricky Skaggs will perform some of his greatest hits along with his band, Kentucky Thunder. 8-time winners of the IBMA’s “Instrumental Group of the Year,” Kentucky Thunder will feature Paul Brewster on tenor vocals and rhythm guitar, Scott Mulvahill on bass and bass vocals, Russ Carson on banjo, Jake Workman on lead guitar, Mike Barnett on fiddle, and Dennis Parker on baritone vocal and guitar. Don’t miss the beloved country music icon Ricky Skaggs in an intimate performance at The Lyric this September.